This timeless tendril bracelet from The Ivy Lane collection by Tacori is destined to become a most-treasured piece of jewelry! Crafted in 18kt rose gold, it combines a chain and shapely bar embellished with pretty pave diamonds and milgrain edging. Classic Tacori Crescent detail and a charm bearing the brand seal complete the posh portrait. 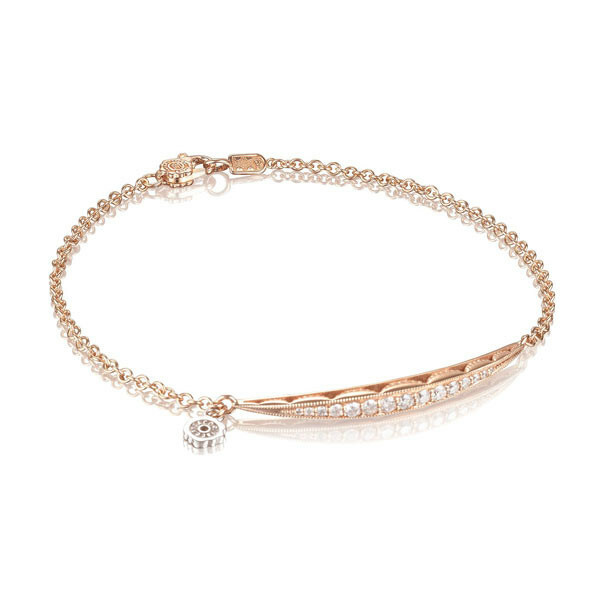 Feel free to wear this Tacori bracelet every day; it's a a simple and stylish standout!